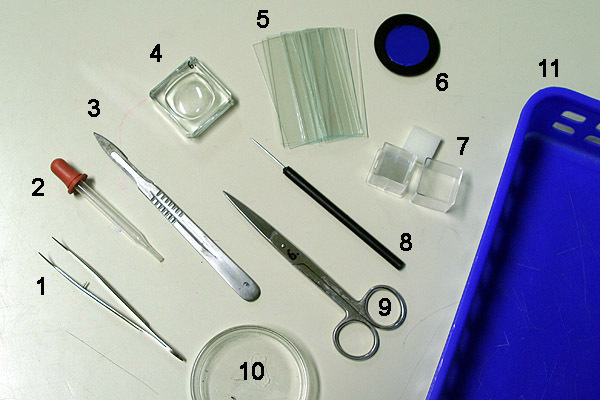 Tweezers: They are useful for placing the cover slip on the specimen and for picking up small specimens (insects, thin cuts, etc.). Dropper: For placing a water drop between the slide and cover glass. Scalpel: Useful for cutting away not needed plant tissue or algae. Do not include for young children. Watch glass: For storing water for making temporary slides. Slides: There are several types available. Some have a frosted side to allow for easier writing, others have rounded edges to decrease the possibility for injury. Blue filter: Useful for compensating the red tint of old tungsten lamps. Cover glasses: obtain those that correspond to the objectives. 0.17mm thickness is standard. Needle: Useful for separating algae or to pick up very small samples of material to be observed. Scissors: For cutting filter paper to remove excess water. Small petri dish: For the storage of specimens that need to be kept in water (plant material, algae, pond water etc.). Cuts of plant material are stored in the dish before they are observed. Plastic tray: For storing the above accessories. The following accessories are also commonly used, but may not be recommended or necessary for each individual workplace. Safety is an issue as well! Razor blades: for making cuts through leaves and stems. Too dangerous to be stored in every workplace, and not always needed. Stains: Some stains are toxic, especially those that are used to stain the DNA inside the nucleus of cells (possibly carcinogenic!). Some may stain clothing irreversibly. Mounting media: These are used to make permanent mounts. They may contain organic solvents which are not healthy when inhaled. There is also the danger that students confuse them with the immersion oil…..
Eldermarrow, styrodur or styrofoam: These are used to make thin cuts of plant material. The plant material is squeezed between two layers of this material and then cut. Eldermarrow is recommended. Styrodur and styrofoam also work but they are very tough on the razor blades and will make them dull extremely quickly.